SHORTLISTED FOR THE 2014 DEBUT CATEGORY - KITCHIES PRIZE LONGLISTED FOR THE 2013 IMPAC DUBLIN LITERARY AWARDS A New York Times bestseller, Mr Penumbra's 24-hour Bookstore is an entirely charming and lovable first novel of mysterious books and dusty bookshops; it is a witty and delightful love-letter to both the old book world and the new. 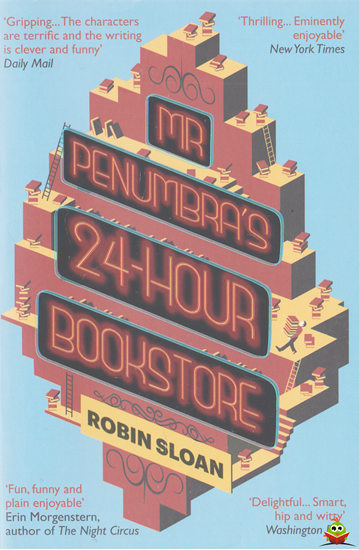 Recession has shuffled Clay Jannon out of his life as a Web-design drone and serendipity coupled with sheer curiosity has landed him a new job working the night shift at Mr. Penumbra's 24-Hour Bookstore. And it doesn't take long for Clay to realize that the quiet, dusty book emporium is even more curious than the name suggests. There are only a few fanatically committed customers, but they never seem to actually buy anything, instead they simply borrow impossibly obscure volumes perched on dangerously high shelves, all according to some elaborate arrangement with the eccentric proprietor. The store must be a front for something larger, Clay concludes, and soon he has plugged in his laptop, roped in his friends (and a cute girl who works for Google) and embarked on a high-tech analysis of the customers' behaviour. What they discover is an ancient secret that can only be solved by modern means, and a global-conspiracy guarded by Mr. Penumbra himself. . . who has mysteriously disappeared.